Ed Boks and Board President Gloria Hershman present the prestigious YHS Founder’s Award to Kathy Coleman, John Tarro and Max Fogleman. What a celebration! I’m talking about the Yavapai HumaneSociety’s annual Reigning Cats & Dogs Gala this past Saturday. This year we celebrated YHS’s 41st anniversary and the role the organization has played in transforming Yavapai County into the safest, pet-friendliest community in the nation! As we celebrated the many successes of the past four decades, a big question concerning YHS’ future was put before the over 350 Gala celebrants. That question was this: Is no-kill here to stay? Was the success of the past three years an anomaly or a beachhead? The resounding response of the gala guests was “Yes, no-kill is here to stay” – and their commitment to the “no-kill” ethic was demonstrated by a record yield in donations dedicated to funding the Yavapai Humane Society’s many life-saving programs. 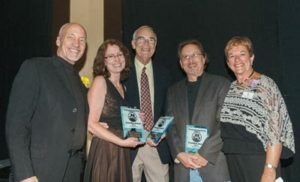 At this year’s event, YHS Board President Gloria Hershman presented the prestigious Yavapai Humane Society Founder’s Awards to former board members John Tarro, Kathy Coleman and Max Fogleman. This dynamic trio helped guide YHS through some of its most difficult years while laying the foundation for YHS’s most recent successes. One of the livelier auction items was for naming rights for the new YHS Cat Care Center. The opening bid was $10,000 and, after a fun and exciting bidding war with Hooligan’s proprietors Pat and Nancy O’Brien, Don and Shirl Pence emerged the winners with a $32,000 bid. In addition to winning the naming rights for the new Pence Cat Care Center, Don and Shirl served their traditional role as this year’s Founders of the Feast by underwriting another year’s gala. Without their generous support, and the support of so many others, YHS could never accomplish all that it does. The Pences were recognized along with Lou Silverstein and Peggy Stidworthy in the first-ever Founder’s Award Presentation at last year’s gala. The vision, leadership and generosity of all our founders laid a sure foundation for YHS and we are profoundly grateful to them all. 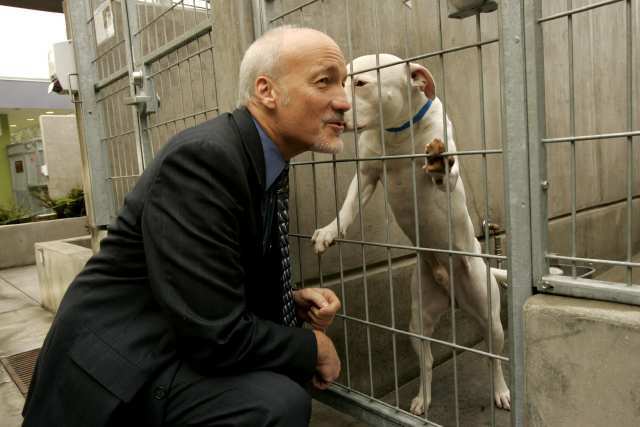 Would you like to help make sure “no-kill” is here to stay? Please consider joining these visionaries in their support of the “no-kill ethic” through the YHS PAWS program. Together we can continue to make our community the safest in the nation for pets. You can do this by donating just $10 a month to ending the killing of adoptable pets. What a difference that would make! With that kind of steady support, YHS could reliably continue to save animals’ lives, fight cruelty, and rescue and protect lost, homeless, sick, abused and neglected animals in our community. And it’s easy to participate in the YHS PAWS (Planned Automatic Withdrawal Service) program. You’ll be joining a growing number of people who are making our entire community a true humane society. By joining PAWS you simply choose the amount that feels comfortable to you; and you can change or cancel your participation any time. A monthly contribution of just $10 (or more) helps feed hungry homeless animals, provide life-saving medicine to ailing animals, and vaccinate and spay/neuter needy pets to help reduce pet disease and overpopulation. Where else can so little do so much?